In an effort to be one step ahead of the Legion of Doom, the Justice League has imprisoned Mister Mxyzptlk in a black diamond cage before his scheduled 90 day appearance on Earth. This does not stop the imp from the Fifth Dimension from causing mischief throughout Metropolis. However his antics don't last long, for Martian Manhunter is making his subconscious repeat his name backwards, thereby neutralizing his powers. Mxyzptlk, after a lengthy explanation of the various dimensions, has agreed to create a door to the Sixth Dimension, the area of the multiverse to which Hawkgirl's wings have a map. Yet, only one being can cross the barrier due to his extended exposure to Mxyzptlk's Fifth Dimension energies - Superman. Will the Man of Steel be able to arrive there in one piece before the Legion of Doom awakens Perpetua completely? Not much time has passed since Superman left for the Sixth Dimension. An older looking Last Son of Krypton in a bright white costume has come to advise the Justice League that they succeeded in their mission. He's modified the dimensional doorway for the rest of the League to cross and see the results of their victory. They arrive in seconds and are met by their future selves. It seems almost too idyllic to be true. However, it may not be real. 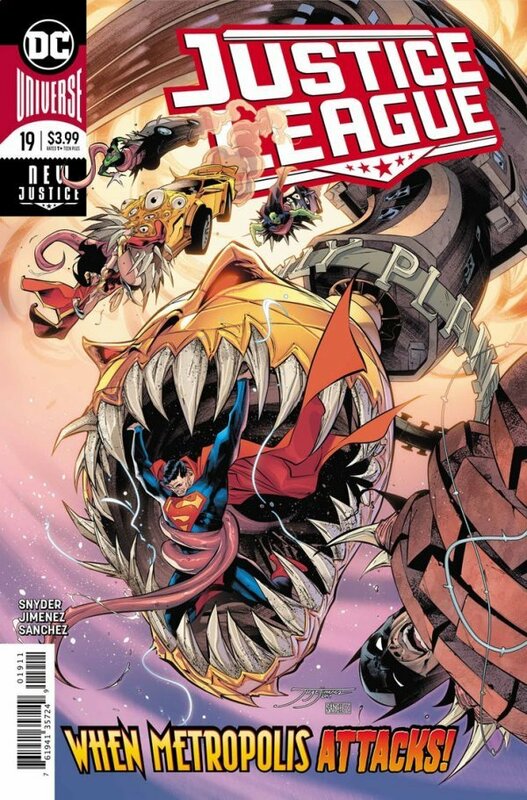 By this issue's conclusion, we see Superman trapped in darkness which could be the end of him and all that exists. We as readers are left to wonder who the future Superman and Justice League truly are. Could they be a sinister illusion, parallel versions of our favorite heroes, or aliens able to imitate them? Story - 5: Okay, I officially retract my harsh reviews of the early issues of this series. 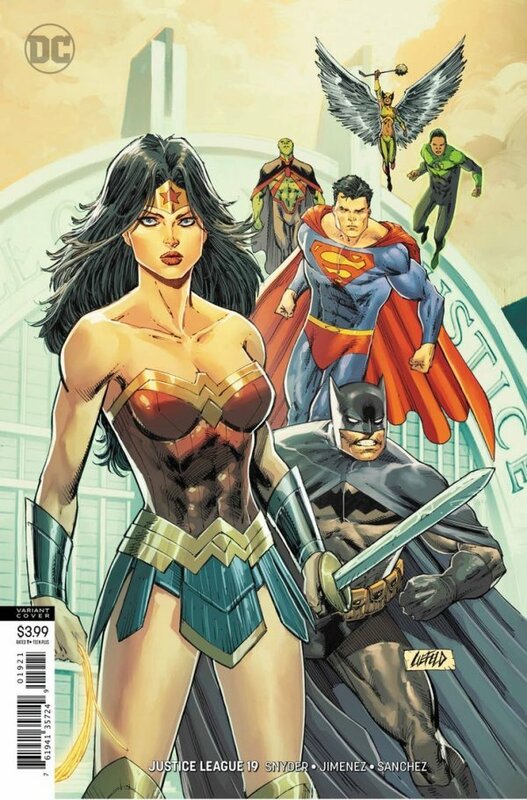 I re-read them along with the ones I've liked, and Justice League is one of the best books DC is publishing. This issue in particular has everything. There's witty banter between the characters, a brilliant balance of character moments and even, fast paced story. It was hard to top issue #9. Yet, Scott Snyder and Jorge Jimenez have done it. Bar none, this is the most incredible chapter in all of the ones I've read so far. I'm a sucker for any story featuring Mister Mxyzptlk, and perhaps that might color my review a bit. However, Scott Snyder and Jorge Jimenez have made Mxy something more than a mischievous imp. They've given him, if you'll pardon the pun, a dimension that suits the character perfectly. He's a mix of Doctor Who and Star Trek's Q combined with elements used in previous stories with Superman's impish sparring partner. I want more Mxyzptlk in this book. Maybe if I ask Scott Snyder and/or Jorge Jimenez nicely, they'll put him in another issue or even devote a future serial to him. Art - 5: After seeing this issue's cover, which we'll get to in a moment, I had high hopes for the interior art in this one. Every page exceeded my expectations. Scott Snyder and Jorge Jimenez could very well be remembered in years to come as one of the best creative teams for the Justice League. They are right up there with Grant Morrison and Howard Porter, Keith Giffen, J.M. DeMatteis and Kevin McGuire in my book. Cover Art - 5: I have to be honest. I thought maybe Perpetua was responsible for the events depicted in this cover. I was relieved to see she wasn't. This image really made me curious about what the cause was. I wish more covers would have the impact of this one. Variant Cover Art - 2: I'm not a fan of Rob Liefeld's style even if it has improved since his X-Force days. Still, with so many artists who could draw a better cover. I can't help but wonder why he was chosen for this one?